Do you remember that video of a little 6 year-old boy in the cockpit of an Etihad Airways jet describing various intricate details of the cockpits instrumentation and operational procedures? It took place on an Etihad flight from Morocco to Abu Dhabi and went viral after the pilot of aircraft,Captain Samer Yakhlef, loaded the video of the boy on social media. After gaining the parents permission of course. Over six million folk have seen that video now and been amazed at the knowledge demonstrated during the short clip. Well, now that little lad, Adam Mohammad Amer, has been back in the cockpit, this time not just as a visitor, but at the controls, as one of the pilots. Etihad Airways invited Adam to their training centre to undergo pilot training for a day. 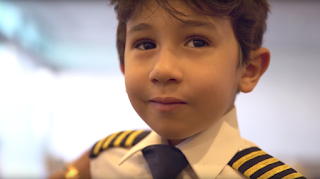 The six-year-old was dressed in a specially made pilot uniform, complete with pilots hat and went through several Airbus A380 simulator sessions. Including a smooth approach and safe gentle landing at Abu Dhabi airport. A real pilot of the future, may your dreams fly high.